After Star War Limited Edition & Sandstone White edition, it’s time for the Lava Red Edition of the OnePlus 5T. OnePlus really loves adding new colors to its flagships and launching them separately and we have seen this a lot of time in the past. 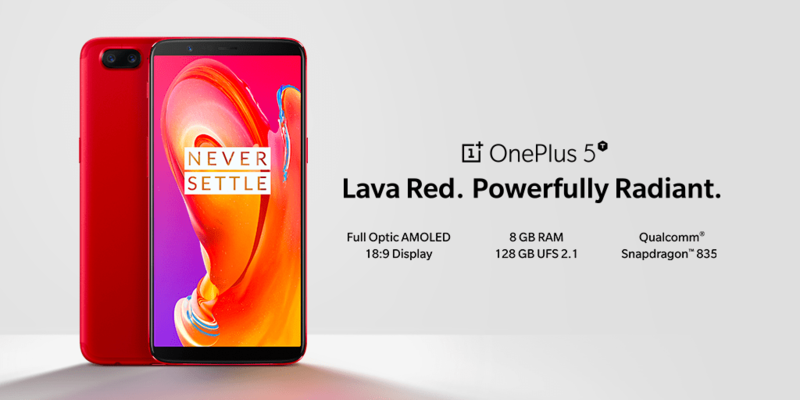 From past few days, the company was teasing a new color variant of its OnePlus 5T and today; the Lava Red OnePlus 5T was launched in India for a price tag of Rs. 37,999 or $595. So, if you want to buy the OnePlus 5T, now you have three choices. You can go for the original Midnight black 5T or the Star Wars Limited Edition OnePlus 5T or the Lava Red OnePlus 5T since all of these are available at the same price, i.e., Rs 37,999. So, the phone has same specifications as compared to the Midnight Black variant of the 5T, but the only difference is that new color. There is now a Lava Red variant of the phone also that you can get for Rs 37,999 and you will get 8GB RAM + 128GB ROM, Snapdragon 835 and an 18:9 FHD+ AMOLED display. Inspired by the dynamic nature of lava with colours that change under different types of light, the radiant Lava Red color shade is achieved through accurate combination of temperature, consistency and baking time with less than 0.01% variation. Additionally, it uses two anodic oxidation processes, using double blasting and an AF coating to ensure the texture and feel. A completely redesigned wallpaper unique to this edition further enhances the user experience. The sale will begin on January 20, and the Sandstone White variant of the phone is expected to arrive pretty soon to India. The phone will be Amazon Exclusive, as always!